For extra flavor and juiciness, stuff the body cavity with aromatic fruits and vegetables, such as quartered onions and lemons. Cut away the wing tips and set aside. When cooking a turkey or chicken, we like to put the wing tips in the bottom of the roasting pan and use with the drippings for a delicious pan gravy. Pass the middle of the string under and around the ends of the drumsticks, crossing the string to make an X. Loop the string around the joints as shown in red. Pull the string tightly along the thigh joint. 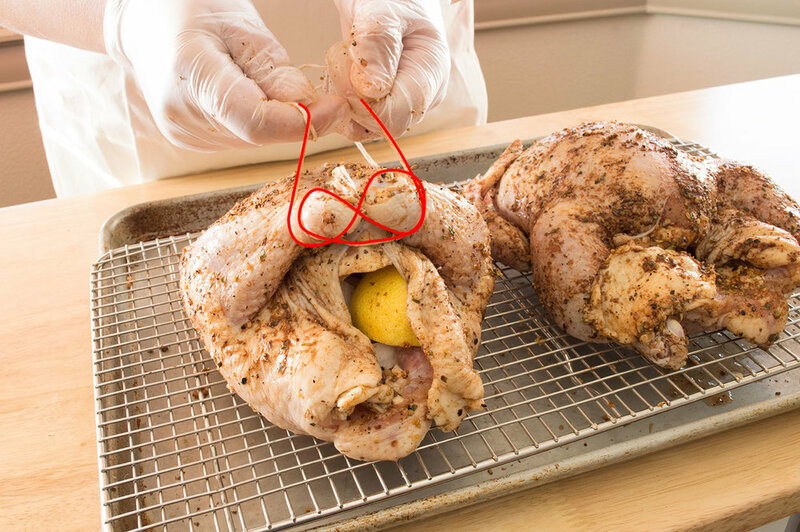 Criss cross the string around the back side of the bird, securing the wings against the body. Pull the ends of the string around the backbone and tie securely. Tuck the skin near the tail around the cavity, sealing in the aromatic vegetables. A properly trussed turkey or chicken will cook nice and evenly, ensuring a moist and delicious meal. It's easy and fast!